This contest started on 6/3/17. This contest has a winner. * Win A $25 Sonny’s Famous Steak Hogies Gift Card. The $25 Gift Card is good at Sonny’s Famous Steak Hogies, 1857 North 66th Avenue, Hollywood, Florida 33024, (954) 989-0561 (sonnysfamoussteakhogies.com for menu, prices, info). ***** Sonny’s Famous Steak Hogies, 1857 North 66th Avenue, Hollywood, Florida 33024, (954) 989-0561. Real simple tale, Sonny’s Famous Steak Hogies is what Jeff Eats calls an “out of sight, out of mind” joint. First told you guys about Sonny’s Famous Steak Hogies on May 30, 2013- hadn’t been back until yesterday when Jeff Eats and Mrs. Jeff Eats did lunch- the 2-steak and 1-meatball hogies killed! This Sonny’s joint is an absolute must try. All I know, if Sonny’s was closer to my Boca Raton neighborhood, Jeff Eats would be a REAL GOOD STEADY CUSTOMER! Last Sunday night, Jeff Eats and Mrs. Jeff Eats were at the Hard Rock to see The Rascals in concert. 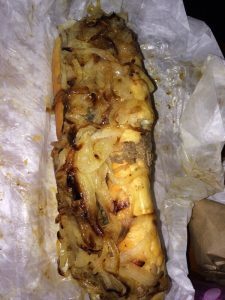 Sitting next to us, were Lynee and Lou Cantor the owners of the “32 East” restaurant in Delray Beach…chit chat, chit chat—and Lou tells me, that if I want to eat great steak subs..then, I gotta try Sonny’s Famous Steak Hogies in Hollywood. Real fast, The Rascals killed it, absolutely fabulous concert…and plans are being set for Jeff Eats and Mrs. Jeff Eats to check-out 32 East, which if the reviews in Yelp, TripAdvisor, OpenTable and various newspapers, magazines and publications are legit– is a terrific American Style joint (by the way, last night- Jeff Eats’ pal Eben–raved about 32 East’s hamburger, but then again Eben thinks that Ted Williams was better than Joe D. so his opinion maybe suspect-here). To make a long story short…Lou really knows his stuff. Jeff Eats got down to Sonny’s yesterday and “tried”– steak hogie, chicken parm hogie, tuna salad hogie, meatball hogie…and I gotta to tell you, this joint’s subs aren’t just good, they are amazing-good…right up there with the best that I’ve ever eaten…and you guys know that Jeff Eats has “done” his fair share of subs. Point of interest, Sonny’s bread is baked fresh every day—it alone is worth the trip…and we’re just talking about a sub roll here! Sonny’s has been in the same location since 1958. In addition to hot/cold subs, its got salads, pastas, pizzas—there is waitstaff service. Back in 2009, Guy Fieri did his tv show Diner, Drive-Ins & Dives there…so, this isn’t a hidden jewel discovered by Jeff Eats…yesterday at 1pm Sonny’s was jammed. Just so we are straight, this guy-Guy Fieri as far as Jeff Eats is concerned, isn’t the be -all and end -all when it comes to knowing what great joint- food is all about. Nothing for nothing, but I honestly believe that huge-tv money/and other factors that have absolutely nothing whatsoever to do with food- “slant” Fiere’s opinions. Take this for what it’s worth…Jeff Eats has been to a number of Fieri’s “picks” and much of the food that he raved about was mediocre at best…While I’m on the “subject”–Jeff Eats for years has questioned the various “reviews” that appear in South Florida’s newspapers and other publications. You guys are smart enough to know, that you gotta-check joints out for yourselves. On the most basic level, what Jeff Eats likes, you may not like and vice versa. 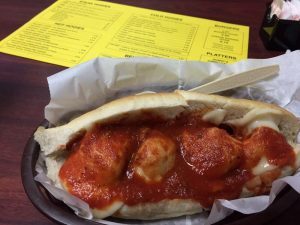 Anyway- Guy made a good call on Sonny’s in that- its subs are definitely dynamite. Real simple…whether you call them subs, hoagies, grinders or whatever your regional preference is—you will absolutely love and I do mean L O V E Sonny’s Famous Steak Hogies…and no, Jeff Eats didn’t -spell hoagies wrong, that’s what Sonny’s calls the sandwiches. 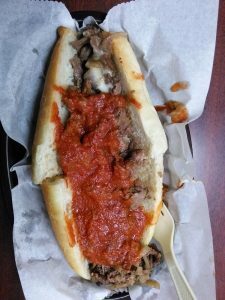 You can check menu/prices/video of Guy Fieri at www.sonnysfamoussteakhogies.com. The joint is open Monday-Saturday 11:30am-9:30pm, Sunday 11:30am-8:30pm. Jeff Eats got down to Sonny’s yesterday and “tried”– steak hogie, chicken parm hogie, tuna salas hogie, meatball hogie…and I gotta to tell you, this joint’s subs aren’t just good, they are amazing-good…right up there with the best that I’ve ever eaten…and you guys know that Jeff Eats has “done” his fair share of subs. Point of interest, Sonny’s bread is baked fresh every day—it alone is worth the trip…and we’re just talking about a sub roll here! Has my time finally come or what? Pleeeeease pick me for this one! This is my lucky submission. This one is for my hubby! !